The anime adaptation of the four-panel manga "Ai Mai Mii". The story follows girls in a manga club—Ai, Mai, Mii, and Ponoka-senpai—who might be fighting evil invaders threatening Earth, facing off against rivals in tournaments, and dealing with other absurd situations when they are not drawing manga. 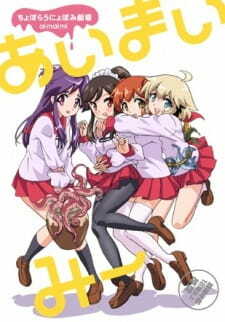 Ai Mai Mi, is a show that is apparently about three girls (Can you guess their names?) who are trying to make a manga together with no real knowledge of how to do so. At least that's what all the other synopsis' say. What it's really about is a whole lot of nothing. You heard me right absolutely nothing. I actually think I'm being generous here. In all actuality there really is no coherent story past the first episode. Everything after is a train wreck of randomness with barely any sense being made throughout the entire running time of about three minutes, which is actually two given the intro and the outro of each episode which are all nearly the same. The only reason I gave this a two is because I felt that if it actually kept itself on an actual plotline than there might have been substance to the show. Your typical everyday characters mixed with some more dull. Every character is completely flat with virtually no substance. I understand this is supposed to be a comedy/gag anime, but there is a line even for the most standard of the genre that they couldn't even meet. None of them even stand out from the others. Given its short run time per episode I can't blame them for having no character development; however this is just annoying. I can't really judge the art of the show very well due to the fact that there isn't much to base it off of. It has its own style (Or at least one I have yet to see before) that radiates weird which given the context of the show isn't necessarily a bad thing. The animation felt average at best, and the designs of the characters are pretty standard as well. There's not really anything wrong with it I just think it could have been better. Again I don't have much room to judge this aspect of the show due to the low number of subs I have actually watched, but with what I have seen I can tell there's really nothing special here as far as voice acting goes. The music from what I recall is virtually nonexistent outside of the OP and ED so don't expect much from there either. *In my personal opinion I find the voices to be a bit annoying, but that might just be me. It's really hard to say. Maybe I just didn't get a lot of the jokes because they pertain to something in Japanese culture that I am simply unaware of; or maybe they are just what they seem like, shallow and random. Whatever the case may be I found myself laughing only minimally with this show. I don't feel I wasted my time because the episodes were so short, but I can't really say I enjoyed it that much either. There have definitely been worse experiences than that of Ai Mai Mi, but this is not very high on the ladder itself. There's not much more to say. This show is short which may be one of the reasons it failed to impress me. There's not much to it other than random short skits that may or may not be funny depending on who you are, and besides that everything else is average at best. There have been worse; however this might be for you; it's not for me to say though. If you think you might like it than give it a whirl. Hell you can watch the entire thing in about the same time it takes to watch two episodes of anything else so it can't hurt to try, eh? So, Ai Mai Mi, a show about three schoolgirls, um, nope that's pretty much it. This show is a comedy and MUCH more importantly a slice of life centered around these schoolgirls and what they do on a daily basis (well, onscreen anyway). So how does it stack up? Enjoyment - don't expect a story like most people have done, watch "for the lulz"
My experience of this show was a positive one in all fairness. Mostly because I love to laugh, I like a good comedy ( I do like many other things in anime too by the way) and this show does most things right to pull off a successful comedy from comical, childish artwork to phenomenal character production. Now the reason I am not giving this aspect a score is because there is no story, none at all. If you read the genre specifics you would know that "slice of life" is there. Three examples of slice of life anime that also don't have much of a story are quite big ones in my opinion: Lucky Star, Azumanga Daioh and Nichijou. Yes, I know, they do follow a story about progressing through school, but in reality, all three don't have a "set-in-stone", fully fledged story to follow, each episode is centered around antics that the characters get up to, and that's exactly what you will find with Ai Mai Mi (albeit without the idea of progressing through school life). This is why I strongly suggest you don't pay attention to any sort of story as it will ruin your experience with watching this show. The sound is very profound in this show, especially when it comes to the sound effects, which are prominent because this is a comedy. Sound is one of the lesser considered whilst making a show in general, let alone a comedy, but when the sound blends together well with all the other aspects (e.g. character and art) then it really adds to experience of the show, which is why I rate it so highly here, the sounds are there to highlight the more comical area of the show, and they are pulled off very well in Ai Mai Mi. Now the only reason I've docked points for this part is due to the character design. The characters are well designed, don't get me wrong here, it probably just me being incredibly nit-picky here, but I think with a bit more attention to small detail, the character design could be great, however my argument against myself here would be that, again, it is a comedy show. The part where this show really does score well, is the scenery and the still life. This is where Seven and Dream Creation outdid themselves. The art style is meant for a comedy show so we can see why there is this childish, cartoony feel to the still life (a good example is in episode 3 during time travel) and for me, that's what scores well. This is where Ai Mai Mi scores brilliantly. Again, I will refer you back to the fact this is a comedy show, so you will expect lot's of childish art and childish voice acting to go with our three main characters here. Since this is a comedy, slice of life, you can probably get through the entire series without really developing the characters much past episode 1. However the producers thought against this and kept giving you insight to the characters as well as used them as good comedy material. With each episode you gain (not much at all, but) some insight to each of our three main females, and that is all you really need for a series who's total running time adds up to just less that 2 normal episodes. The best way to watch this is to deffinetely heed my advice and not look out for any specific plot. If you do this, your viewing experience will be ruined as you wont find anything of plot value. Another great way to watch this, is to literally watch it "for the lulz" since this show is just supposed to be this messy ball of comedy. Since this is what I did, I enjoyed it quite a lot. This will probably be the sole factor on what you base your score upon, hence why you can understand that this shows average is less than 6, because it wasn't watched properly. If you want a compelling story, logical outcomes, and good character development, then you are in the wrong place. Ai Mai Mi has none of that stuff that makes "Good" anime (In a purely subjective high-horse stance) and is completely insanity and stupidity. I loved the fla-doodle out of this show. I thought it was funny as all hell. It's absurdity made it golden. Using a whole new line to make a point makes a review look professional trust me. All in all, I loved it, and if you can appreciate true craziness, you'll love it too. This anime has to be one of the most random anime I ever watch. It was so random. Each 3 min episode it had own little storyline, but the anime as a whole didnt. I give it a 6 because even though it was random it got me interested and glued to the screen making me wonder what's gonna happened next. It also had different anime references like dragon ball z, hell girl, Shiba Inuko-san, Bakugan, at some point in the anime they went from japan to new jersey. which was pretty hilarious. the art has different drawing styles to it. they would go from a kawaii drawing style to deeper more realistic, less cartoony style. i find it interesting they change the whole art with the mood that the anime is going in. I was delighted by the characters voicing actors and the ending credit, i must say if you didn't like the anime itself you're mostly gonna like the ending credit song, its so kawaii and catchy. Each character has there own unique style to them with makes this anime even more captivating. Are they memorable or be one of my favorites anime characters? No Enjoyable? Yes. I think what played a big part in me enjoying this anime is the anime references that put in their anime, making me say aye, i know that anime, aye i know that one too. this anime is so random yet so interesting. Even the narrator at the beginning is random with his own stories. I wouldn't say its one of the funniest anime ive watch but i would be lying if i say i didn't have a smile on my face while watching it.